It was an early morning ride from Manila to Baguio for our 2010 strategic planning which was held at Baguio Country Club in Dec 2-5, 2009. We had a late lunch as soon as we arrived and immediately after we proceeded to the conference room to start the planning session. It was an outright presentation of objectives and directions to guide everyone on the proceedings of the session. It was an activity full of interaction and I myself have engaged in some discussions related to Sales and Marketing, when I am in fact in the field of Supply Chain. Well, that was the point of it all, to be engaged in the discussions and plans of other Business Unit (BU) as it was not intended for BU heads to present their plans only but to engage themselves in the different strategies of different BUs for alignment. First day was a long day, but Me and Mike D. (the Transformer) planned for a morning run in the cold and beautiful city of Baguio. Given the busy schedule, we took a time off to go out and do our morning runs. We slept around 12 mn the and woke up at 5:00 am, got up and geared up and took off at 5:30am. We did a very slow pace (conversational pace) and have talked about a lot of stuff (work, life, insights, and even personal stuff). 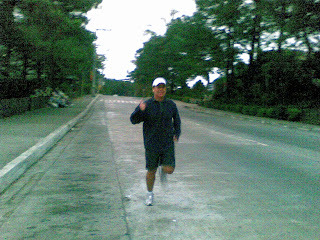 It was a recovery run for me since I just finished another half marathon (21km) last Nov. 29 and my legs were a bit stiff, that after finishing my full marathon a week before (Nov. 22). We finished a good 6 km jog enough to energize ourselves for the day’s activity. We took our breakfast, cleaned up, and got ready in time for Day 2’s session. The morning run felt good and it kept us energized for the day’s activity. We were active the whole day and stayed engaged the whole time. The meeting lasted a bit later around 9pm and had late dinner, but the long hours didn’t matter to us as we came prepared both physically and mentally. A long day indeed, but I was programmed to run the following day. Me and Mike planned for a 10km run this time and invited some of the guys to join us (those who failed to join the first day run). Same routine, woke up at 5am, and took off at 5:30 am. 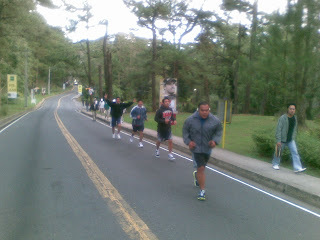 I used a different route, we started at Camp John Hay and went around in some portions of the City. I was measuring the distance in such a way that we will be back in the club at exactly 10km. I texted Ric (EHS Manager-Sales & Distribution) before we took off, and asked if they will join, but He replied to me when we were 2km away already. Good thing, they still continued with their run. He was with Jomel (EHS Manager-Factory). It was a non conversational run supposedly for me and Mike so that we can run our pace, the first 3km was uphill and was difficult really to set a faster pace. I just took it lightly as my hamstring was feeling some pain so I just did a gradual pace and took some walk breaks. 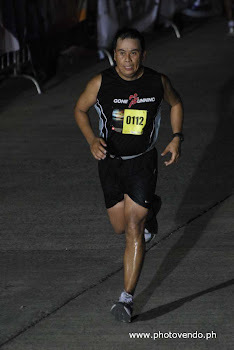 It was not intended to be a tempo run or a race pace, enough to keep the mileage. As we were heading back, I saw Gilbert (Service Manager) doing his own morning walk, I was glad that at least there were 5 of us awake in the early morning doing our exercise. Moving on, I figured that we were short by 800 m reaching the club house. So I immediately told Mike and told him that we were short, and that we have to complete it. So off we went for an extra km and met up with Ric, Jomel, and Gilbert. It was a good feeling to see more of us running, I then took the opportunity to indoctrinate the 3 (Ric, Jomel, and Gilbert) that they are now part of the official runners of CCAC (Concepcion Carrier Airconditioning Company). They have the challenge to run the 10k in the Condura Run in February 2010. Let’s see their progress by then. We did have fun and off we went to face Day 3 activities. 1. It can be done – most of us think that time is a problem to start any fitness activity because of work, priority, and other activities. By accepting the fact that a healthy living entails some fitness activities, then you will make time for it. A 30 min or an hour of your time each day will not hurt. Try it, you may find yourself permanently putting fitness into your daily schedule. 2. A healthy body, a healthy mind – starting the day with a good exercise provides an extra kick in the day ahead. Have you experienced feeling ready to take the day’s challenges because you are energized? You become attentive, mentally stimulated and engaged the whole day and not letting any problem pass unresolved. 3. Running friends – it surely motivates a person to engage in fitness activities especially if you have friends to train or exercise with. Find a group or a friend to run or exercise with. You need a boost once in a while. Keep track of your progress as well it will help you to become conscious of your fitness program. 4. Work, Life, Balance – for us professionals and busy bodies, we are sometimes caught up with the busy schedule at work, but this should not stop us to make time for our personal activities. Don’t be a slave of your work, but instead, try to find time to stay fit and healthy. At the end of the day this will help you perform better at work. Knight Runner leading the way..
Fun moment with Jomel, Ric, and Gilbert. Ready for the day's activities. With Mike, Gilbert, Jomel, and Ric.